A 26-year-old cyclist was recently hit by a train going nearly 90 mph in south Poland and lived to tell the tale, according to officials. Heart-stopping CCTV footage of the near-death encounter shows the bike rider, who Polish police said ignored a red light and boom gate, barreling towards the tracks when a train seemingly smashes right into him. Footage from the other side of the train reveals the biker ricocheted off the train, tumbling through the air and landing onto a nearby heap of rocks. The incredible event happened on Nov. 5, but Poland's national railway company only released the video Wednesday as "a lesson in how not to cross the tracks", said Miroslaw Siemieniec, a spokesman for Polskie Koleje Panstwowe, according to the BBC. 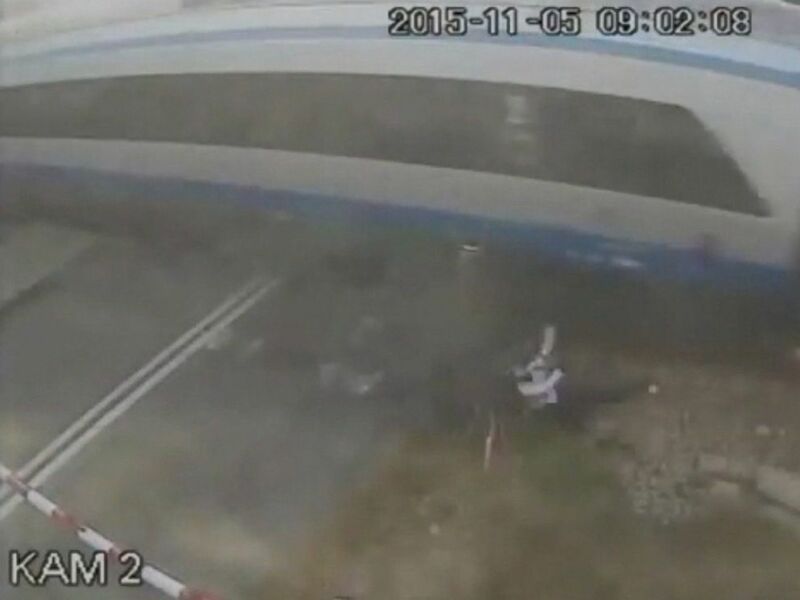 CCTV footage published on Dec. 9, 2015 shows a cyclist crashing into a high-speed train in Poland. The cyclist escaped with only minor injuries and a $180 fine from police for ignoring the red light and boom gate the railway crossing, Siemieniec said. The train was delayed for 40 minutes as a result of the accident, Siemieniec added.